than the area around it. they are not actually black. Never look directly at the sun with or without a telescope. The sun is a bright light in the sky. So bright that you rally can't and should not look at it. With the right equipment and techniques you can actually look closely at the sun. One of the earliest techniques was to point a telescope at the sun and project the image onto a piece of paper. 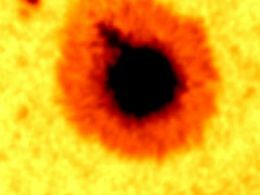 When astronomers first used this method they were surprised to see what looked like black spots on the sun's surface. Since then special filters have been developed that allow seeing event more detail and other features like solar flares. So what are these spots? A sunspot is an area on the sun that is cooler than the area around it. While they look like plack spots, they are not actually black. They area surrounding the spots are so bright that they appear black. If you were to take the rest of the sun out of the picture, the sun spots would actually be quite bright. The sun spots in the picture to the left are actually larger than the earth. They are thousands of milse across. These spots appear and then dissapear within a few days or weeks. Some years there are more spots appearing on the sun. There is actually a pattern to their appearance thais calle the sun spot cycle. So what causes these spots? 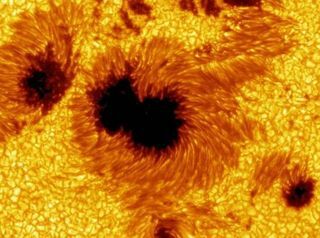 Magnetic fields are an important factor in the creation of sunspots. The Sun has a magnetic field with a magnetic north and south pole, just like Earth. However, over a cycle of 22 years, the magnetic north and south poles of the Sun will switch places. 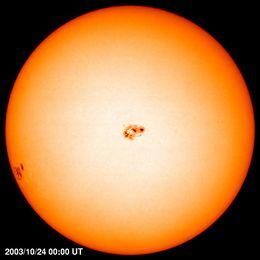 Various observations have confirmed that sunspots are associated with areas of strong magnetic fields and that their appearance is linked to the 22 year cycle of the Sun's magnetic pole reversal. Another important concept in explaining sunspots is convection. The Sun is a main sequence star which is burning hydrogen into helium in its core. In certain areas of the Sun, the energy created by the hydrogen burning is carried to its surface by convection, similar to a pot of boiling water. Convection is the main mechanism for transporting energy to the surface of the Sun. However, strong magnetic fields can inhibit the motion due to convection, so energy is unable to reach the surface in these areas. This leads to areas with temperatures cooler than that of the rest of the surface of the Sun. Watch an animation of a sunspot.